Both the original group and the Johanson party enjoyed food and fellowship. For a middling fisherman like me, a nibble in a backcountry lake is a big deal, especially the first one after eight days on the trail. I eagerly reeled in the hook I had cast into the high-elevation lake beneath Isberg Peak in southeastern Yosemite, only to feel the line abruptly stick. My sinker had lodged beneath a rock on the lake bottom. Normally an angler simply cuts a stuck line, but in this case that would mean sacrificing the fish hooked on its end. What to do? I could think of no other remedy than to shed my clothes and swim into the frigid water. Holding my pole above the water with one hand and clumsily paddling with the other, I made my way over the troublesome stone and shook the line free. Then I kicked my way back to shore and reeled it in. As I shivered in my underwear, I pulled a 12-inch trout ashore and shouted out in triumph. That evening we enjoyed a fresh fish dinner in camp as we laughed ourselves silly over the incident, just like my dad would have done if he’d been there. A savvy fisherman, he probably would have crafted a more elegant solution to the dilemma, but he also would have loved the humor of my less-than-elegant catch. I almost felt like I heard him chuckling, and feeling close to him was actually the whole point of the trip. My father Tom Johanson, 77, died on March 19 after a brave eight-year struggle with cancer. An exceptional husband, father and grandfather, Dad was the one who taught me to love the outdoors on scores of family camping and fishing trips. For that and countless other reasons, his passing left a void that’s painful, to say the least. Going through his belongings, I found a fascinating photo album of a High Sierra hike he took with his Oakland scout troop in 1952 when he was just 14. Dad had shown it to me before, but since then I had become an avid backpacker myself, and I examined it again with renewed interest. Beautiful black and white images illustrated an ambitious journey, two weeks and 137 miles long. As I saw his youthful image throughout the book, inspiration struck me. I decided to recreate his long-ago adventure with whoever wanted to come along. Journeying with family and friends, and with Dad along in spirit, would help to fill the void. Nothing would have pleased him more than for his loved ones to enjoy quality time together in the mountains. First to join the team was my brother Dan, followed by our younger cousin Linnae and our close friend Bob. Cousins Peter and AnaLisse accompanied us for the first night also. 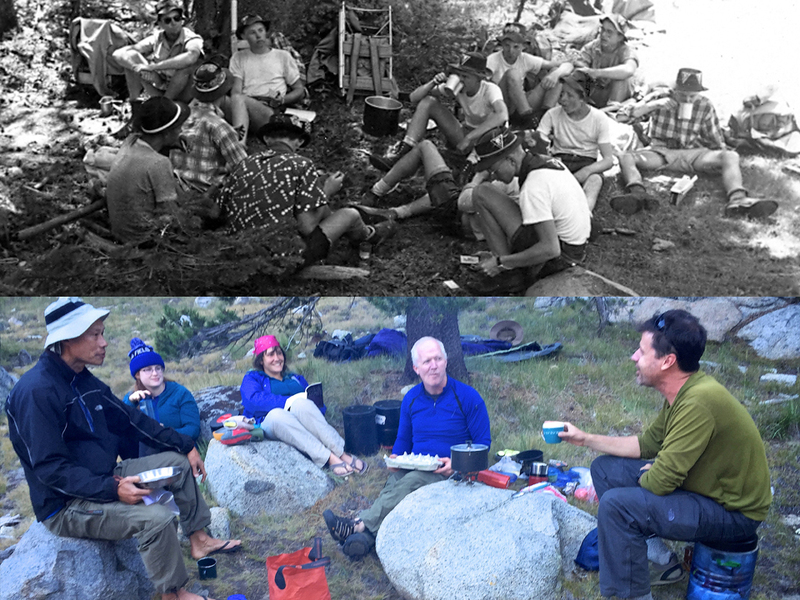 We departed from Tuolumne Meadows on Aug. 3, just as Dad’s group had done exactly 63 years before. There’s no better way to spend a summer day than strolling down picturesque Lyell Canyon beside the gently-flowing Tuolumne River. The mostly-flat trail makes for a gentle start to a long hike, also. We trekked around eight miles before making camp near the end of the canyon. There we shared a flask of whiskey and toasted both my dad and also my late Uncle Ted (Peter’s father), another big-hearted mountain man who helped introduce Peter, Dan and me to the great outdoors. Peter made the team a fine dinner and he deserved a better reward for that than he got. His air mattress sprung a leak that night and he woke up itching from head to toe. He’d earlier lent his sleeping bag to a friend who apparently exposed it to poison oak! Peter and AnaLisse were returning home anyway, so at least he got to take a shower and sleep in a bed again. The rest of us made the tough climb over Donohue Pass, 11,056 feet above sea level. Following days took us to such scenic wonders as Thousand Island Lake and beneath the inspiring peaks of the Ansel Adams Wilderness, like Banner Peak. I had hiked this segment of the John Muir Trail before, but no one else in our group had, and the grandeur of the scenery astounded the team. Dan, a photographer, snapped pictures like mad. Bob, an experienced globetrotting traveler, said he’d never seen anything like it. And Linnae, just 15, happily hiked like a champ on her first big backpacking trip. Every day brought new sights, lighter packs and a closer connection to the natural wonder that attracted both our group and my dad’s troop to the mountains. We’ll never know the full details of his experience here but I realized we never would have taken this journey together if he hadn’t inspired us with many outdoor outings and unwavering love. Beside our camping spot on the third night stood a short, blocky wall of granite. It looked like a nice little climb, so I scampered up, as did the others later. We named the route “Thanks Dad” and rated it a friendly 5.6. Our fourth day took us to Ediza Lake, a magnificent gem surrounded by impressive peaks like Mt. Ritter. Dad and his troop summited the 13,157-foot peak in 1952, and we aimed to do the same. Bob, Dan and I set off in mid-morning, leaving Linnae to manage base camp. After a pleasant stroll up to the base of the mountain, the real work began. The flanks of Mt. Ritter are covered in loose dirt and scree, making the climb a constant “two steps forward, one step back” type of endurance challenge. As we labored, I thought of the first time I attempted the peak a dozen years earlier. Dad had come along as far as base camp to support me, like he always did, while I tried for the top alone. I did not summit, but we still enjoyed the outing which turned out to be our last camping trip together. 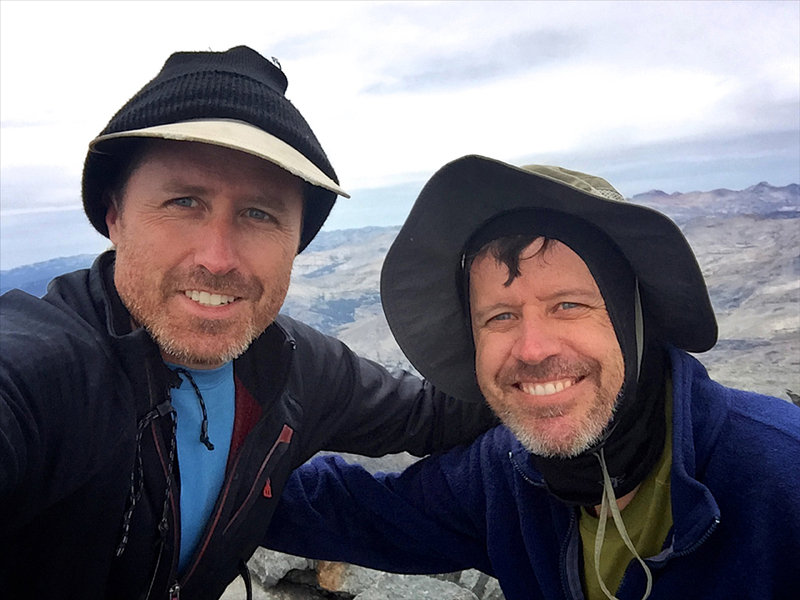 Dan and Matt Johanson celebrate reaching the summit of Mt. Ritter. We reached the summit around 2 p.m., weary but joyful. Just like Dad had done? The effort exhausted us and it was hard to believe that he and his fellow scouts had managed such a herculean ascent in their early teens. Yet the photo album showed a dozen of them happily perched on the summit. Dan was able to call our mom and share the moment with her before we started down. The descent was no picnic either and three weary climbers stumbled back to Ediza Lake hours later, grateful to reunite with Linnae, enjoy a hot meal and down the last of the whiskey. That night was the last on the trail for most of our group, who were summoned back to the lowlands by the inconvenient demands of civilization. A half-day march took us to Agnew Meadows, where we caught a shuttle to Mammoth Lakes. There we met cousin Anna, who delivered a car for Dan, Linnae and Bob to drive home. An indulgent dinner, cold beer, world-class company, hot showers and soft beds highlighted a night in town. Among other things, we celebrated Dan’s birthday as my “kid” brother turned 40 years old. As the old crew headed home the following morning, Anna and I started the journey’s second half. 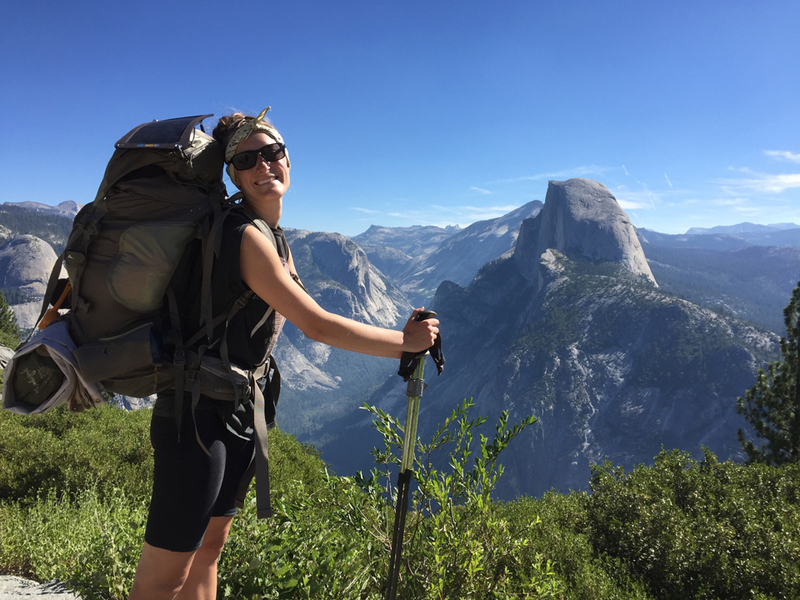 Just 25, Anna was already a fine backpacker with two treks down the 220-mile John Muir Trail to her credit. But on this leg of the trip, both of us broke new ground. We headed east from Devils Postpile to re-enter Yosemite from the south, and then traverse the park’s seldom-visited southeast backcountry to Glacier Point, just like Dad had done. Together we trudged under heavy packs up the Granite Staircase and then descended through a tree-filled valley to Corral Meadow. The first day on the trail is always tough, but then so is Anna, who cheerfully hiked in high spirits. The next days took us down into the North Fork of the San Joaquin River canyon and back up out of it again, past the splendid Cora, Sadler and Isberg lakes and back into Yosemite via Isberg Pass, taking a short detour to summit Isberg Peak, 10,996 feet high. That evening marked my first fish catch and unscheduled bath. If the John Muir Trail is the heavily-traveled interstate highway of the backcountry, we now followed a forgotten back road, seeing hardly a soul for days, unless you count the marmots which ran about in droves. Though I’d been hiking throughout Yosemite for more than 20 years, I’d never passed through this part of the park before, nor seen the towering Triple Divide, Merced and Gray peaks from this perspective. Our fourth day since leaving Mammoth Lakes took us up and over Red Peak Pass, the last difficult climb of the trip. From there we descended to Lower Ottoman Lake for a refreshing swim and pleasant night. Another long march took us past Mt. Starr King to Illilouette Creek where we made our final camp. Fish darted around in the water, and I pulled out my pole in hopes of improving our dinner. I thought back to all the times Dad took my brothers and me angling, recalling that often we boys would land more fish than Dad did. Only when I was older did I realize that Dad often hooked a catch on his line and then handed the pole to one of us to reel in. I wondered if Anna had ever caught a fish in the backcountry. A tug pulled at my line. “Hey Anna, would you hold this pole for a minute?” I asked. Anna obliged, and looked up in surprise a moment later. “I’ve got one!” she exclaimed. “Really? Reel it in!” I said. Soon she had landed a small trout, just big enough to provide an appetizer for our last supper. “Did you do that on purpose?” she asked. “Would I do that?” I replied, smiling just as Dad would have done. Our final push took us through a burned forest. Fire raged through this canyon decades ago, killing thousands of trees. Scorched and blackened wooden skeletons towered over us. Yet life abounds in this renewed woodland. Squirrels and woodpeckers make their home here. A spotted doe bounded across our path as hawks, owls and grouse flew overhead. Water ran over the burned earth. Golden wildflowers, finer than the red carpet at the nearby Ahwahnee Hotel, lined our path. And countless young trees are growing in the shadow of their giant forebearers. “Whenever I heard nature’s call, I was always glad I answered,” Dad once said. So was I as we walked the last miles to Glacier Point. My family will always miss Dad, but as we headed home, I was comforted by the realization that he, like the trees and the mountains themselves, will always be with us. Anna Padlo proved a fine partner on the hike’s second half.